My husband’s most passionate hobby (much like my sewing/craft hobby) is kayaking. 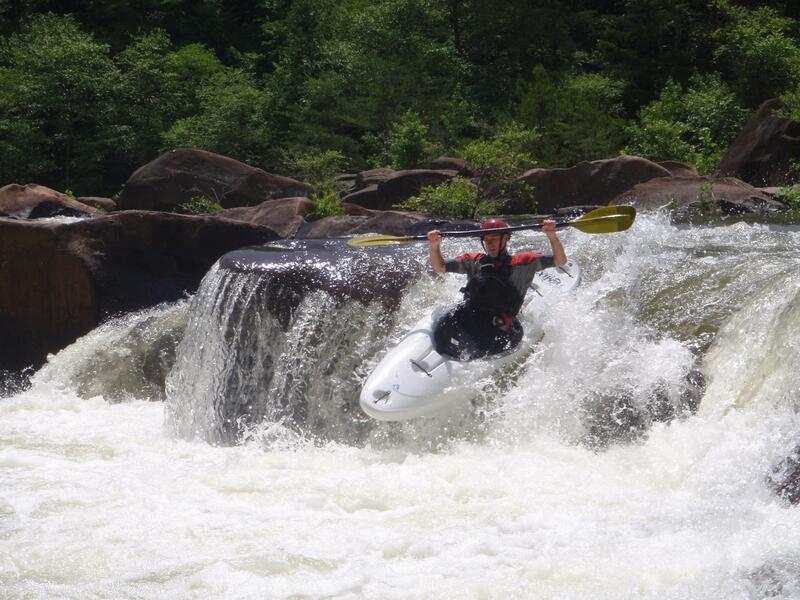 And I mean serious kayaking, he throws himself down class 5 rapids in tiny little playboats- thank goodness he has a good life insurance policy. Hee hee, I kid, I kid! Anyhow, he goes kayaking all year long, all around the Southeast where the water is running. Needless to say, the water can get COLD no matter what time of the year it is. 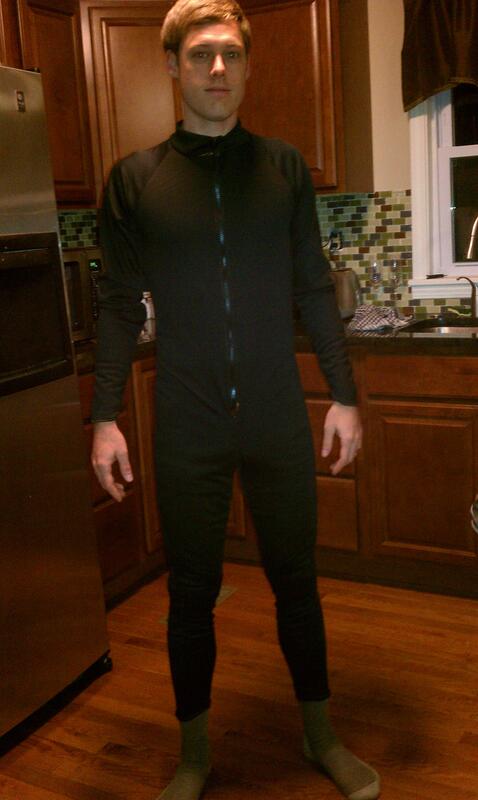 So he asked me to sew him a Union suit, it is a stretch full body suit that he wears underneath his dry suit to add an extra layer of warmth. 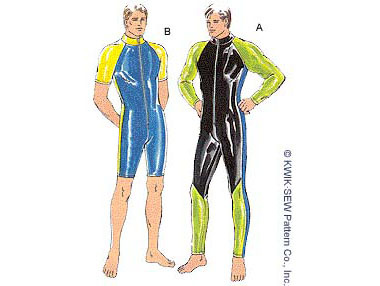 He actually got online and found this Kwiksew pattern 2335 to use as a template, its pretty much a wetsuit but clearly this pattern has been around since the 90’s judging from the neon green and electric blue color they used. Lucky for him I let him pick the fabric he wanted to use or he would’ve ended up with a 90’s hot pink version. He found a synthetic rayon/polyester blend material (in solid black of course) not waterproof but would absorb sweat and provide some insulation. It was surprising easy to sew, Kwiksew patterns are very clear in their instructions. I did end up using bright orange thread which actually looked pretty cool, gave it a sporty look. The most fun part was putting in the 24″ zipper, I used a sports version but they do have waterproof ones. It turned out good though a little snug and short, this is just the prototype though according to Chris. For the next one he wants to order Neoprene which is a rubberbased fabric that flicks sweat away from your body. Our good friend DJ who is also a big kayaking enthusiast is in line for one too. 🙂 Here’s a picture of Chris in action. He has used his Union suit for 2 boating trips and it has kept him nice and toasty! Hello all! Welcome to my first ever creativity blog! I really excited to begin sharing all my sewing projects and crafty designs and projects with you. I was married to the love of my life last November, and I received a new Singer Sewing machine as a wedding gift from my wonderful Italian Aunt Ida from New York who highly encourages domestic skills and old school traditions. Although it is a pretty standard machine, (no fancy schmancy computerized screens or buttons), I have been able to make some pretty impressive and diverse items if I do say so myself! This was one of my first projects, it is a long drapey vest that I made from a soft rayon blend material, it is a pretty plum color that I found at Joann’s Fabrics (with a coupon of course). It was a pretty easy sew, I used the Simplicity pattern #2283 although it is funny how seemingly easy directions can stump you! I was on a roll until the point where the neck band attached to the back of the vest. I read it over and over for an hour and looked at the black and white illustrations and just couldn’t comprehend how to roll it a certain way and match the notches (that I forgot to mark- go figure). I had to just step away and finish it the next day when it finally clicked. I opted out on hemming the garment as the material is very flowy and thin and it just didn’t look right to me with a hem. I think it turned out pretty cute! Great for hanging out on the weekends with my buddies or going to grab a casual drink.